The idea and practice of limited government begins with Christianity. Pagan antiquity could not imagine such a thing, because there was no distinction between religion and governance. For the pagan, there is an overall order to all existing things; both human beings and divine beings are part of that order. For the Biblical believer, God is the Creator of the whole of things and their order, not part of that order. God, not subject to the order created, can be simultaneously beyond and intimately present within that order. God’s relationship to the Creation is free, because it is based on God’s pure gift of being to all created beings. God is love. It is this free relationship of the Creator to the creation that stands at the heart of personhood. Pagans are not persons, but parts, destined to dissolve back into the whole. Pagan gods, whether destined to dissolve or not, are still parts of the system. “Person” (originally a theatrical term and then a legal one for a role that is played) was first used to designate a kind of being when it was used to name God’s being present to us (and to Himself) as any one of the persons of the Trinity. Only after acknowledgement of God’s personhood was the human being also described as a person. The human being is a person by virtue of being made in the image of God, which also means being capable of communion with the divine person. Thus personhood is a dimension of being human, opened up by the Jewish covenantal tradition, and made more fully available through the fuller communion and manifestation of loving personhood in the Incarnation. This possibility of communion of personhood, open to any human being as human in relation to the Creator of all, means that the one who participates in this communion transcends the particular earthly city or empire to which he or she belongs, and is a citizen of the city of God. Institutionally, this transcendent belonging is visibly embodied in the Church. Thus it is the Church that shows the state that it is limited in its authority and sway over persons because of their inherent dignity. It is this separation and limitation that is first recognized and instituted in principle by Constantine; at the same time, Constantine’s continual meddling in the self-governance of the Church shows the inability of political powers to consistently respect that separation and limitation from their own side. This is why limited government not only begins with the Church, but depends on the Church for its continuance. The state cannot be self-limiting, because it cannot define what falls outside its boundaries without thereby proclaiming its authority to determine what the parameters of that “outside” entity can be. Over the course of the history of “Christendom” the consensus of limited government has been developed and maintained by the fact that the communion of personhood which constitutes the human transcendence of the state’s purview is sustained and publicly acknowledged in practices belonging to “civil society” (i.e. non-state practices and institutions). That consensus is now disappearing, because the practices that cultivate and sustain our experiential awareness of our transcendent personhood are ceasing to shape our souls. The practices of communion of personhood are those of prayer, penitential examination of conscience and acknowledgment of sin, an imagination of praiseworthy life shaped by reflection on the Bible and the Saints, liturgical and sacramental participation in worship, and in general the receptivity (actual or intended) to grace. An especially lucid description of the requirements of such receptivity to communion attained in prayer is provided by the writings of the Desert Fathers. Evagrius of Pontus in particular describes how certain “thoughts” lead our souls into imaginings and desires that draw us away from communion with God. These thoughts fall into eight varieties – gluttony, greed, lust, anger, vainglory, pride, sadness and listlessness (the ultimate origin of the later classification of “deadly sins”). 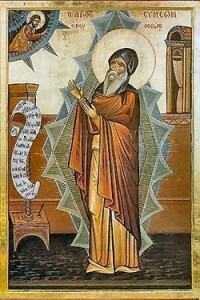 With acute psychological self-observation, Evagrius and others in the “hesychastic” tradition describe and provide awareness of how the “demonic forces” work on us through these thoughts to destroy our capacity for communion of personhood with God, and thus diminish our very personhood itself. While most worshippers do not attain this degree of lucidity and precision in the struggle with sin, all the practices of communion cultivate an interiority and recognition of this struggle and at least some of its contours. No one can sincerely desire to live in obedience to the command to love God and neighbor without discovering the many impediments in one’s own soul. Knowing that we share this knowledge of our sinfulness with our neighbors (who also recognize the authority of the love commands) provides our shared awareness of our transcendent personhood, and thus also our shared recognition of the limits of government’s jurisdiction over our interior lives that reach out beyond both ourselves and our state. Today, what is it that shapes our interior lives of thoughts, imaginings and passions? For most Americans, increasingly for most of the world, it is electronic forms of entertainment. I do not think there can be any doubt that, rather than cultivating our awareness of the thoughts that destroy our personhood, entertainment media provide those thoughts with direct entry into and power over our imaginations and passions. In the terms of the hesychastic tradition, they constantly admit and reinforce all the demonic influences that render us incapable of communion, shaping a consciousness that does not even attain awareness of the possibility and reality of that communion. The hesychasts fled to the desert because they recognized the demonic character of the public culture of the cities, which even Constantine’s “clean start” in a new capitol without old temples had not really purged. If entertainment media constitute our demonic public culture, they do so in a more insidious fashion: rather than providing a merely external set of practices and spectacles from which one can escape into interior personhood, they provide us with a simulacrum of interiority and a bogus substitute for communion in the Holy Spirit. Universally shared public acknowledgment in civil society of the transcendent dignity of our communion of personhood has come to an end, and electronic entertainment has contributed to that ending more than we realize. I fear that with it has come to an end our shared existential awareness of the inherent limits of government, and the accompanying intuitive understanding that freedom of worship is the first freedom. Those who maintain such communal self-awareness can only appear as freaks and fanatics to those who don’t. If worshipers of the God revealed in Scripture, Covenant and Incarnation are to sustain communities to preserve and share and witness to that communal self-awareness, they will have to be countercultural communities preserving the traditions and practices of interiority and communion. In order to do so, they will have to insulate themselves from the culture of electronic entertainment. If we abandon our children to those demons, they’ll never be able to fully appreciate what a church is for. Next articleMaking a Home Where You Live. An Interview.